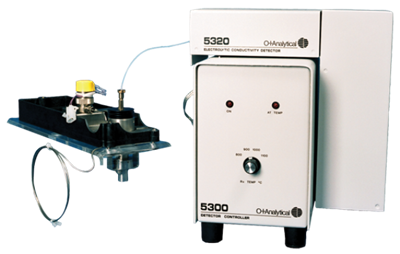 The Model 5320 Electrolytic Conductivity Detector (ELCD) excels in select detection of halogen-containing compounds, while also proving its flexibility by offering sulfur and nitrogen detection. The Model 5320 is our third-generation ELCD. It combines three key components: a reactor assembly, cell-solvent assembly, and detector controller. Its principal mode of operation is the halogen mode (X), but sulfur (S) and nitrogen (N) modes are also available. Each detection mode kit contains all of the required materials (except the solvent) to operate the ELCD in specified mode.